Made of high quality durable sturdy metal and stackable up to 4 levels safely, fully stacked, holds 32 Wine Bottles Snug & Securely organized. Environmental painting applied to the surface, which can effectively prevent rust and oxidation, extend the service life. Decorative freestanding wine rack is ideal for both new wine collectors and expert connoisseurs. This simple yet elegant design of the wine bottle rack makes it a great display piece that you'll be proud to have out. Stores bottles horizontally to prevent oxidation while preventing the cork from drying which keeps wine fresh and longer until you're ready to drink. 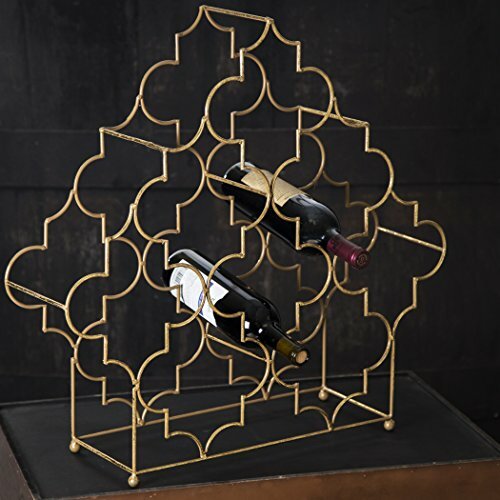 Home decor accent, Modern and Geometric, your 8-bottle wine rack has an antiqued gold finish for an industrial meets glam look. If you have any questions about this product by Le'raze, contact us by completing and submitting the form below. If you are looking for a specif part number, please include it with your message.